The meaning of the shop:DIDa is the ticking of time.And time is precious and eternal for us.High-quality products and superior service are what we will value and what we will pursue forever,just like the significant meaning of time for us! Material:Environmental protection copper electroplate white gold/gold/rose gold with 3A cubic zirconia,hypoallergenic,suitable for sensitive skin. 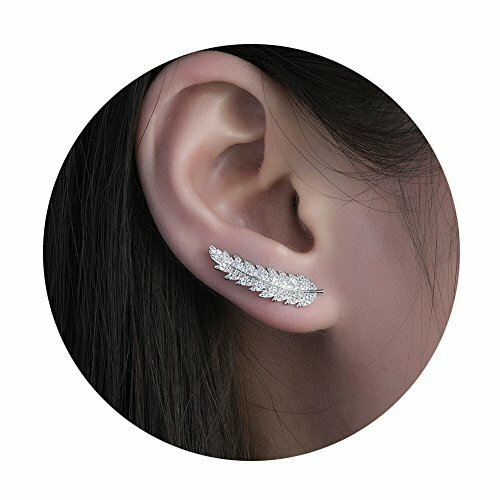 Size:length:1.18",width:0.2".These ear climbers can run along the curve of yours ears perfectly. Package:Ear crawler earrings/Earring gift box/Extra earrings backs.Notice:If your ears are small,you need to wear earring backs when wearing. Style:These leaf ear climbers are so cute and delicate,can show personality and temperament very well.